11 Day Tour — Tour departs year round. *MRTA Member Price. BAsed on double occupancy – two people to a room. Air fare is additional but can be arranged for you. Germany is a country filled with spectacular scenery, medieval towns, fairytale castles, a fascinating history, fun oompah music, and world-class beer. On this Germany tour, you’ll see Germany’s highlights and visit its most famous cities, as well as its medieval towns and scenic areas. Your vacation begins and ends in Frankfurt with overnights also in Düsseldorf, Berlin, Nuremberg, Munich, Oberammergau, and the Black Forest. You’ll visit the must-see attractions in each city, including the famous gothic cathedral in Cologne, with its twin-steepled towers, and the Kaiser Wilhelm Memorial Church in Berlin, badly damaged during the war and today a symbol of reconciliation. Magnificent scenery also awaits you on this Germany vacation. Enjoy a cruise along the most scenic section of the Rhine River, with castle-crested hills, terraced vineyards, and pretty wine towns. Join the Romantic Road with its charming villages, cobblestone streets, walled cities, and scenic countryside, and stop in Rothenburg, a walled town that has retained its medieval character. Visit King Ludwig II’s Neuschwanstein Castle, nestled high in the Alps. Drive on the panoramic German Alpine Road to beautiful Lake Constance, Europe’s largest freshwater reservoir, and to the charming island of Lindau. Enjoy Germany’s lush Black Forest region, where you’ll learn about the art of woodcarving and enjoy coffee and Black Forest Cake—a special experience included by Globus. A tour to Germany would not be complete without sampling the local cuisine and beer. That’s why Globus has included a beer at a famous brewery in Cologne, founded over 100 years ago. Bratwurst has been a tradition in Nuremberg for many centuries, and Globus has included dinner at a local Nuremberg restaurant to taste the traditional Nürnberger Bratwürste.From the beautiful scenery and exciting cities to the traditional food and wonderful beer, this Germany tour has it all! Leave the navigating to us – and just sit back and enjoy the ride. Learn how Globus is reducing transportation-related energy use and greenhouse gas emissions. This is a very special trip focusing on Martin Luther. Start in Berlin, visit the Kaiser Wilhelm Memorial Church and take pictures of the Brandenburg Gate and the Holocaust Memorial. In Wittenberg, visit the Luther House and Museum, and the Melanchthon House. Continue to Leipzig, and visit the Thomaskirche, where J.S. Bach worked. Also included are visits to Luther’s birthplace, Eisleben; the Augustinian Monastery in Erfurt; Eisenach, to visit Wartburg Castle, where Luther translated the Bible; Coburg Fortress, and Worms, where the Imperial Council passed judgement on Luther in 1521. Visit the cathedral where Luther presented his case, the Trinity Church and the famed Reformation Monument. In Mainz, a romantic Rhine Cruise is included in the prettiest part of the Rhine Valley. 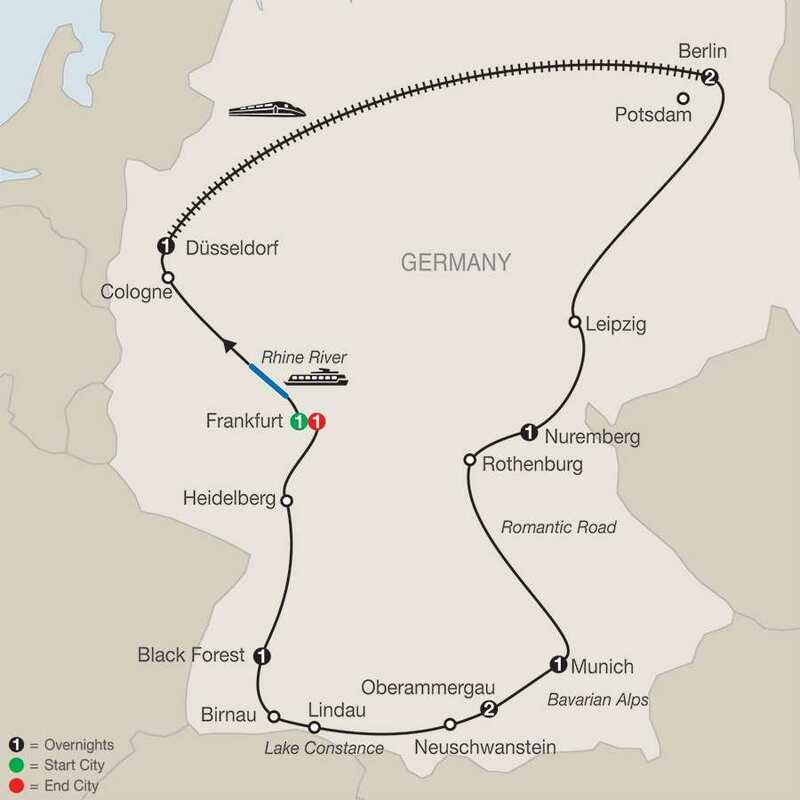 Two exclusive stops make this customized tour unique: HESSENPARK, an open-air museum, and SAALBURG, a UNESCO World Heritage Site. Next is the medieval walled town of Rothenburg, famous for its Christmas ornaments. End in Munich and visit Marienplatz with its Old and New Town Halls. An optional excursion to King Ludwig’s Linderhof Castle and the Passion Play town of Oberammergau is available. In the evening, enjoy a farewell dinner at your hotel. Time to rest or to start exploring the bustling metropolis on the Main River. At 6 pm, meet your Tour Director and traveling companions and leave the hotel for a special welcome dinner at Schwarzer Stern restaurant. On your way south through what used to be the “other” Germany, visit Leipzig, an important center since the Middle Ages. See the Thomaskirche, where J.S. Bach worked, and the Market Square with its fine renaissance buildings. Continue to Nuremberg, the town of children’s toys and gingerbread. Admire the impressive medieval ramparts and walk through the pedestrian area of the charming Old Town to St. Sebald Church, painstakingly reconstructed as a monument to peace from the rubble of near-total wartime destruction, and admire the Schöner Brunnen, a 14th-century fountain dedicated to the Holy Roman Empire. It is said that it brings good luck to spin the two brass rings. Then, have dinner at Bratwurst Röslein restaurant to taste the traditional Nürnberger Bratwürste. Join the Romantic Road and arrive in medieval Rothenburg with its ramparts and towers, cobblestone lanes, and 16th-century houses. Hear how the town survived the Thirty Years’ War, and shop for Christmas ornaments, for which this pretty town is famous. Next is the Bavarian capital, Munich. Tonight, you may wish to join an exciting optional dinner outing. Start today with a visit to King Ludwig’s magnificent NEUSCHWANSTEIN CASTLE, which inspired Walt Disney. Follow your Local Guide through this fairytale castle on its craggy outcrop high above a sparkling lake. Then, continue along the panoramic German Alpine Road to the sunny northern shore of Lake Constance, Europe’s largest freshwater reservoir. Visit the charming island of Lindau, then continue west and visit the baroque CHURCH at Birnau. Enter the lush Black Forest and enjoy an overnight stay at the family-owned Hofgut Sternen hotel. 2017 departures are subject to itinerary and price modification. Details will be available in September 2016. *Indicates that this departure and vacation is available for 2017 early booking. All tours will be open for 2017 bookings in the Fall of 2016. Vacation upgrades and/or additions will not be available for early booking, as well as, any extra pre- or post-night pricing until the Fall of 2016. With the exception of Journeys Club discounts, future travel promotions are not applicable and are not retroactive on early bookings. Offer reliant on space availability. Applies to new 2017 bookings only. Full cancellation penalties will apply. Additional restrictions may apply. Single Supplement and Triple Reduction pricing listed above is for 2016 only. For 2017 departures, select “RESERVE NOW” to receive the 2017 price.